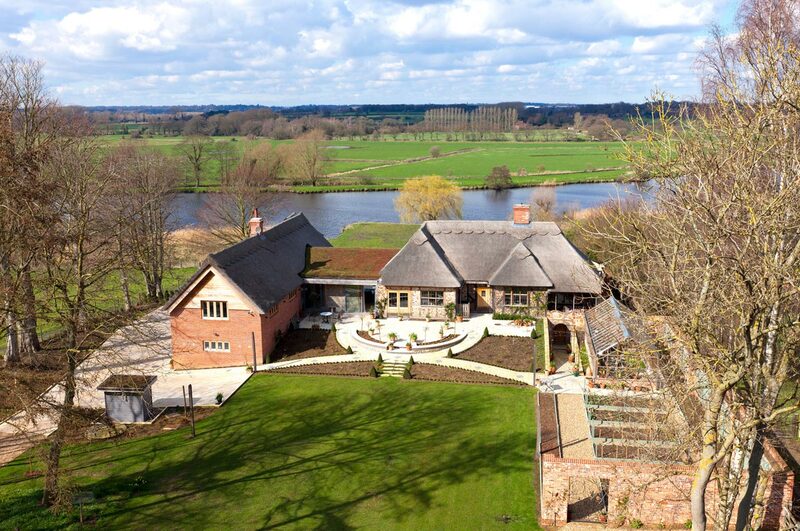 This project involved a substantial 2-storey thatched extension to an existing dwelling on a highly visible and sensitive riverside site in the heart of the Norfolk Broads. It includes some significant alterations and repairs to the existing building which is of exposed oak timber framing with random brick infill panels and a thatched roof. The site has a considerable fall down to the River and the change in levels provided the opportunity to create a split level design which incorporates an additional floor of accommodation within the existing roof profile. The proposed extension uses traditional materials to reflect those used in the existing building, however these have been used to create a contemporary design reflected in the extent and proportion of the windows and the use of simple brickwork with panels of timber and flint. There is a clear delineation between the existing building and the extension by virtue of a low profile green roof and the full height glazing to the living room. This linking section includes a profiled rooflight to create visual interest in the roof form and also introduce additional daylight into the space. The extension is of timber frame construction with a mixture of brickwork and timber cladding. This combines the benefits of a highly insulated structural frame with traditional facing materials that reflect those of the existing building. Large areas of glazing provide excellent levels of daylight and take full advantage of the views towards the river. The roof is thatch which is a highly sustainable, natural building material with wildlife conservation benefits as well as providing a thermally efficient weather proof covering. The link uses a green roof planted with sedums which apart from providing additional wildlife habitat will ameliorate rainwater run off. Switching the span of the thatched roof over the new extension provides a visual stop and provides a degree of interest without becoming too complicated. Thatch is a material that benefits from simple roof forms in order to ensure that weathering details function correctly. The principle entrance has been changed to the side of the extension and is defined by a projecting timber bay at the upper floor level which also provides a degree of shelter to the entrance. This arrangement not only rationalises the internal circulation but also creates definition to the external spaces around the dwelling. In addition there is a greater degree of permeability to the extended dwelling with sliding glazed screens and doors allowing more interaction with its surroundings. Overall the new enlarged house reflects the constraints and benefits of the site by combining the functional requirements of the brief with the latest in sustainable thinking. It makes use of light and aspect to create comfortable spaces that exploit the views and connect with the landscape setting.